I met Ruth Moose, several years ago, when I taught ‘Yoga for Creative People’ through UNC-Chapel Hill’s Adult Continuing Education Program. The class was geared to explore how mini yoga practices could support and amplify creative effort. Ruth was probably the most well known writer in the room, but you would never know that from her. She explored all of the postures and accompanying writing exercises with enthusiasm and often peals of laughter. I was taken with her generosity of encouraging comments toward other participants’ work. Her commitment to supporting other writers and creative folk is almost legendary as I came to learn. 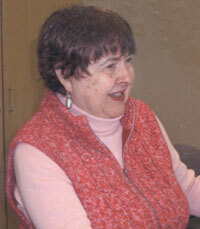 A majority of North Carolina writers and artists know Ruth and have either been mentored or taught by her. I am so happy I caught up with her recently to talk about her latest collection of short stories, Neighbors and Other Strangers. Tell us about your new short story collection, Neighbors and Other Strangers. What inspired it? Are there recurring themes that you explore? Neighbors and Other Strangers is the first of three collections of short stories I have in the accumulations bin. These stories were written over a period of years and pulled from the files in an attempt to center around a theme. I saw a sort of older, maybe 1960s sort of neighborhood where each of these narrators might live. They represent blue-collar folks, those on a lower rung on the middle class. People I know who don’t get into the literature very much. Real people with real lives who do their jobs, love their families (mostly) and get by every day with some patience and a lot of fortitude. What advice do you wish someone had given you as you were developing your craft as a writer? Also, what was the best writing advice you got? I have accumulated so much advice over the years, and given so much, it’s hard to pick out shining moments or gold nuggets. If writing is your passion, nothing is ever going to stop you. Not all the rejections in the world. You may be momentarily slammed down (and trust me I have been, still am), but you’ll somehow pick yourself up and find yourself back on the page. I’ve told students writers don’t need alcohol or drugs. The writing life can give you the highest highs…..finishing a good piece, getting something published, wining an award. Those are the true highs. The best writing advice I ever got and give, is the oldest…..read, read, read. Fill your mind with words, live on them, and feed on them. Poetry is one of your loves. What keeps you coming back to the form of poetry for self-expression? Poetry is not my first love. It’s always the short story. But poetry feeds your writing, your life, and your mind. I really treasure these online poem-a-day sites. And I often print out the poems, tape them to my office bookshelves, and enjoy them longer than the few seconds on the screen. Some I’ve kept taped to my kitchen cabinets until they yellow and crinkle and I’ve almost memorized them. You’re known for the poetry collection, The Librarian, that you wrote through the ‘persona’ of a librarian. How did you come to write those poems? It’s funny The Librarian poems have gotten such an audience. I’ve never written so many poems through the persona viewpoint. She’s me, but not me, if that makes sense. I do have a graduate degree in library science and worked as a reference librarian, so I borrowed the setting, etc. But I am a teetotaler, haven’t had a gentleman caller (the Scholar in The Librarian) and a lot of the other stuff that’s pure imagination in the poems. I do have a cat, but he’s nicer than Percy. The second half of that collection was written first. The grief poems were how I dealt with my husband’s death. It is a long and protracted grief that even almost ten years later can ambush. Somehow the Librarian stepped into my life, jerked me up short and said “Enough”, move on. So I have….slowly. The last librarian poem says that. When I wrote it I knew it was the last one of the 55 persona poems for the collection. It’s very, very difficult to write through grief and grieving without getting bogged in clichés. That was one of the hurdles. Maybe the Librarian truly helped me jump the hurdles. While a faculty member at the University of North Carolina-Chapel Hill you received an award for distinguished teaching at the undergraduate level. What did you enjoy about teaching student writers? I loved teaching! And each semester always felt I got the best class ever. Those shiny faces, eager eyes, and bright smiles. I loved planning writing assignments, prompts, reading their work. And I got a lot of really good work. I even got a kick out of reading their papers, seeing real leaps in their writing, thinking, and imagination. There are so many good writing tips and I’ve just enjoyed and used a million of them over the years. So I’d say just use the one that works best for the moment, the place you’re in, both in your writing and your life. But the golden rule is always read, and, of course, look and listen with all your heart. And try to get some of it on paper. Ruth Moose is the author of three collections of short stories, Neighbors and Other Strangers (Main Street Rag Press), The Wreath Ribbon Quilt (St. Andrews Press) and Dreaming in Color (August House) as well as five poetry collections. Her poems and stories have appeared Atlantic Monthly, Redbook, Prairie Schooner, Yankee, The Nation, Christian Science Monitor and other places. Her stories have been published in England, Holland, South Africa, and Denmark. She received a McDowell Colony Fellowship and was recognized for outstanding teaching before recently retiring from The University of North Carolina-Chapel Hill.